For your music library to exist at all, you will have to procure music in some way. This chapter starts with your existing CD collection, explaining how to 'rip' CDs to a computer audio format, and then goes on to explain how to find, purchase and download music from the Internet. This is the first of a series of posts serializing the Music Library Management ebook. I'm posting the same content here to make it easier for people to find the information via Google. "Ripping" is the transfer of music from an audio CD to computer audio files, stored on a computer or server. First, a quick (and I do mean quick, and light) refresher on CDs. CDs store digital music, not analog music like a vinyl record. The music is stored as hard, binary data on the CD. When a CD is produced, the music is recorded at the rate of 44,100 samples per second (44.1 kHz). When you rip a CD, software on the PC reads this data and then converts it to a computer music file. A computer music file is typically stored in a different manner to CD music, and there are different types of music file. These different types are optimised for different things. Some are optimised for quality, some are optimised for lower storage requirements. 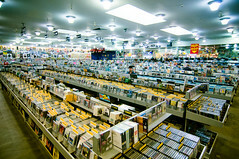 Once the CD is read and the computer music files are being produced, most CD rippers will also try to find data on the Web about the music. Album name, artist name, year of release and such metadata will be retrieved and 'tagged' inside the music files. These 'tags' are read by your music player and displayed to help you browse and search your music collection. If you perform a CD rip yourself it means installing CD ripper software, inserting a CD, running the rip and checking the quality of the tagging is sufficient. An alternative is to use a CD ripping service who, for a fee (of course), will collect your CDs and return them along with their digital copies, with all the metadata lovingly retrieved and cleaned. If you decide to go this route then consider that if you acquire any further CDs you may wish to rip them too, so knowing how to rip can still be useful. I'm not normally the type of person who reads a manual cover-to-cover before trying something out. I don't think many people are. But I do recommend benefiting from my experience before starting your ripping. You don't want to rip a few hundred CDs only to find you have to do it again. Here's my first, perhaps surprising, suggestion. Don't rip to MP3s. Don't create MP3 files from CDs. Instead, create 'lossless' music files. What are lossless music files? Traditionally (and I use the term loosely), CDs were ripped to 'lossy' audio formats such as MP3. Lossy formats are so-called because they lose information when the music is converted from the CD to the computer audio file. When the file is created, parts of the original audio track that it thinks you are unlikely to be able to hear are discarded. Lossless ripping, however, does not remove any incoming data from the CD. The resulting file is always a true reflection of the music on the CD. You can theoretically re-create the CD at the same quality level. More importantly, lossless music can also be transcoded into different formats (such as MP3) with better results. Because the music has had nothing removed, the codec has more data to work with and can produce a better result than if a lossy format was used. In theory, if you rip to lossless you never need rip again. There are a number of different lossless formats, but my recommendation is to use either Apple Lossless (if you are wedded to the Apple ecosystem; iTunes, iPhone et al) or FLAC. The beauty of lossless is that this decision doesn't matter much; if you get it wrong you can convert later without having to get your CDs out again! Rip to FLAC or Apple Lossless, right from the start. Sure, if you just want to 'give it a first go', rip an MP3 or two. But after that, as soon as you are ripping music you will want to keep, make the jump to lossless. It will save you a lot of time and effort in the future, and you know your music is a high enough quality should you invest in upgrading your hi-fi equipment. The second thing to consider are tags. Most CD ripping software will allow you to save a few basic tags. It's essential these tags are saved and stored within the music files. 'Tagging' music by storing internal textual metadata about the music is the most flexible way of exchanging information about music files between music players. If all the data is stored within your music player you won't get the benefit of all that metadata when your music is transferred to, say, your mobile phone. Next, get specialised. And by this I mean: use CD ripping software, not a music player, to rip CDs. Many music players rip CDs, sure. But they are dumbed down and limited in functionality. You may require a specialised CD ripper to rip to lossless music files. Further, a music player is more likely to tag music files in a manner that makes sense to itself, not other music players. In reality, many people use more than one music player: one in their lounge, one on their computer, one on their mobile phone and so on. Using specialised CD ripper software makes it more likely you'll produce flexible, portable computer music files. But, that said, it's all about your music player(s). Ultimately, my wise words about lossless music files and so on are irrelevant if you rip to a format that your music player cannot read. Similarly, some music players don't read the more exotic tags. Some of music library management is understanding the limitations of your music player, both to meld your music library to suit your player, and to help you make better decisions about different music players that you can use. There's more to computer audio libraries than that, but I think we probably learn best by doing. In the next section I step through the ripping of a CD to lossless format, and finally I'll refer you to what you should be doing once your albums are ripped. The only change is that the tracks on the CD have been recognised. However, there are no track names, artist name or album name. We need to configure the metadata tagger. See that "freedb" label at the top/centre? That's what we need to click, but before that, we need to configure an email address so that the metadata lookup works. The email address is only used when submitting new CD data back to FreeDB, so for now you can use a made up email address. Click the EAV menu, then Metadata Options.... You can enter your own email address if you like, but a made-up email address works just as well; there's no confirmation step you must perform from your email account. Click OK.
Don't worry! This doesn't mean the music will be deleted (in fact: it cannot - CDs cannot be edited once created). It means that EAC's internal memory of this CD, which currently consists of the unnamed tracks, album name and so on, will be deleted. We don't want this information anyway, so click Yes. If nothing is found for your album, you can simplify the search term and try again. Click on the resolution of the image you want to use. This highlights the image in blue. Then click Transfer selected cover to EAC and the art will appear with the rest of the metadata. You'll be asked if you want to download lyrics. Personally, I find these less important than art. Click No for now, it's something you can come back to later. Our CD has now been identified and we've even found some album art for it. We are ready to rip! ... and the final step of testing our rip begins. The first thing to do is play your newly ripped music. This is sensible as a "sanity test". If you were to rip hundreds of CDs you wouldn't want to have to re-rip them all if you found something you didn't like, would you? Do the album and artist names appear correctly? Is the genre showing correctly? Does the music play? Can you skip through it? Are the tracks roughly the length you expect? If any of these items are answered in the negative, that doesn't necessarily mean you should re-rip. There are a number of problems common with ripping CDs. Some of them are obvious straight away and some take a while to become obvious. Either way, the next section discusses these problems and ways to solve them. The most fundamental, and arguably most important, measure of whether a rip was successful or not is whether the actual music has been reproduced accurately. The most serious problem when ripping CDs, and one that cannot be worked around, is physical damage. It seems inevitable that CDs incur physical scratches and dinks over time (more often than not these seem to me to occur when lending CDs to friends, but I digress). Sometimes these scratches will render your CD unrippable. Sometimes the CD will rip, but the resulting computer music files will be full of skips and jumps. The most straightforward remedy is to buy a new CD. I know, I know... it seems strange if you are simply ripping these CDs to digital format. Why not just download new copies? However, as I mentioned under What are lossless music files?, unless you can purchase lossless versions of your albums then you are reducing the quality of your music library. To that end, purchasing a new CD might be the only way to go because most downloads aren't available in lossless form. Some software is more tolerant of physical errors on CDs than others. If you have a CD with errors it may be worth trying these. Look for EAC (http://www.exactaudiocopy.de/), Cdparanoia (http://www.xiph.org/paranoia/index.html) and AccurateRip (http://www.accuraterip.com/). Note, though, that a CD may be beyond rescue. That 'nuclear' problem aside, many of the problems inherent to CD ripping are related to a CD ripper's reliance on user-entered data. Those album and artist names, genres and year information may, in some cases, appear quirky or just downright wrong. There's a good reason for this: the data has been "crowd-sourced". Crowd-sourcing data refers to receiving data from a large number of individuals and then deciding what data to use from the results. Probably the most well known example of crowdsourcing in this age is Wikipedia. The same approach is used for CD databases, and the most common example of crows sourced music data is CDDB and freedb. The story of CDDB is an interesting history of what happens when software licences change. It's also a lesson in the importance of keeping data open and accessible to all. The original design of the CD mimics traditional audio-only media such as vinyl records. An audio CD contains a sequence of audio tracks and that is all; there is no provision for information about the tracks, at least until recently (the newish CD-Text specification means that you can sometimes now get CDs with metadata). Historically, the packaging would identify the music to the listener. Track listings on the back of the packaging would identify which track is where on the CD. With the move to computer based audio, however, the packaging was lost. The result was that a way was needed to identify the music so that it could be easily chosen for playback. Step forward CDDB, originally an embedded database installed with the grandaddy of computer music players, xmcd. Initially the CDDB shipped with each copy of software was used by each individual user, but soon submissions of track information were accepted via email, and republished in the CDDB with each downloaded copy of the software. Eventually the submission process was moved to a website and the service grew enormously. At the same time, the software which ran the website was released under the GNU General Public Licence (GPL), 'CDDB Inc' was incorporated and advertising was placed on the website. This meant that the users believed the service would remain free. This was in 1995. By 1998 the service was sold, with the service eventually being operated by the now familiar-to-some Gracenote (Gracenote were subsequently acquired by Sony in 2008). Only now, the licence was changed and was far more restrictive. Software could only use CDDB with no other databases and furthermore, notoriously, was even forced to display a logo of CDDB (later Gracenote) while a lookup was being made. Finally, Gracenote in 2001 banned all unlicenced software from accessing CDDB. This, on a dataset that was primarily built by music lovers submitting their CD information! Fortunately, because the original data had been licenced under the GPL, the data was available to be 'forked' (copied) into what became the 'freedb' project. From there, freedb became the default online CD database of choice and that used by most CD ripping programs (some, such as iTunes, still use Gracenote for CD ripping). Thanks to the foresight of the original programmers, the data remains free to music lovers to this day. The advantage of the crowd-sourcing approach is that coverage is excellent. I'd estimate around 95% of the CDs I rip are found in online databases. The disadvantage is that the quality of data is not so good. It's not so much inaccuracies (although they do exist). It's more the inconsistencies. Similar albums for the same artist will be tagged with quite diverse genres. I once ripped "Let It Bleed" by the Rolling Stones and the resulting files were tagged with a genre of "Classical". Classic Rock maybe, but not "Classical". Some online CD databases are better than others. Generally, I find the MusicBrainz database better than the FreeDB one. Inevitably, some level of post rip customisation of metadata will be required. Even if the tags are correct, sometimes the internal structure of your music library may be compromised. To re-iterate the genre example, a highly specific genre may be tagged for an album and thus introduced to your music collection whereas you would prefer broader, more general genres. How to deal with these situations, and how to correct metadata without re-ripping, is discussed in the 'organising' chapter. The alternative to ripping music from CD is purchasing it online and downloading it. The advantages are that this approach is much more convenient... so convenient in fact that you do not even need to leave your house and the music is delivered within minutes. The disadvantage is that an overwhelming amount of music is sold in lower-than-CD quality. Just as you should, where possible, rip to lossless, you should purchase music at CD levels of quality or higher. Or higher? Yup. Digital music can now be purchased at quality levels better than CD. As I mentioned above, CDs are recorded at a sample rate of 44.1kHz. Music, generally called HD (High Definition) music, can now be purchased at 96kHz and even higher, theoretically offering better audio reproduction. Note, though, that whether the human ear can actually tell any difference is much debated, with vociferous opinions voiced for both arguments. There are even some claims that the practicalities of playback for >44.1kHz music mean that the sound quality ends up being worse. Whether you buy all your music online and download it, or rip it yourself from CD, here's a quick overview of the next important steps in building your music library. First, get clued up on where to store your music. Many people start with storing it on their desktop computer, but for various reasons that can be inefficient and possibly insecure. The chapter 'Storing' discusses alternatives. Next, get ready to secure your music. If you spend a long time ripping music or spend a lot of money downloading it you don't want to lose it to a virus or some other disaster. Check out the 'Securing' chapter for ideas on how to lock down your music library and lower your risk. Finally, listen to your music, interact with it, and don't necessarily think that annoyances with how your music is organised, browsed or played are insurmountable. There is a wealth of different music players with strengths and weaknesses, and, using tagging, there are many different ways to organise your music collection. The latter is discussed in the 'Organising' chapter. So you've got some music, either by ripping it, downloading it or transferring it from some other source. The next thing to think about is how and where you are storing your digital music collection. The decisions you make at this stage can affect how easy it is to share, synchronise and secure your music library. This is the first of a series of posts serializing the Music Library Management ebook. The next chapter, Storing, is now available! Thanks to kozumel for the image above.